Our technicians are able to assist in any kind of auto motive locksmith situation involving any vehicle including caravan, bus, car, truck, van as well as motorbikes. Any time you have locked yourself out of the key, locked your keys inside the car, lost or snapped your car key, call us and you will be helped within a span of 1 hour. We respond within 15 minutes after your call and we deliver quick and sure services at all times at the fairest price in the whole of the Milton Keynes area. Have You Locked Your Keys Inside Your Car Or Locked Yourself Outside Your Car? Do not panic. Just call Auto Locksmith Milton Keynes technicians and they will get you back to your vehicle without delay. We are experts in opening car locks without harming the lock, so you can get the locked in keys back in a few minutes. If you have no trace of the car keys, we have quality materials and equipments to make a brand new key for your particular car model. 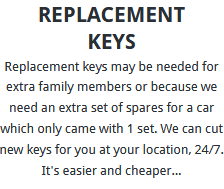 If the client is financially able, our technicians recommend the use of genuine car manufacturer blank keys for replacement, but if you are operating on low budget, there is an answer for you too. You can use quality aftermarket blank keys, which we have tested and verified. We understand that for some car makes and models, a genuine replacement blank key can be very expensive and for this reason we advise our clients on cheaper and quality alternatives from trusted builders. However, much cheaper options may not work perfectly, since it could be made from low quality materials or may not have the standard size. This could either fail to work or damage your car ignition switch hence more expenses. What Do I Do When I Have Lost Your My Car Keys? Misplacing your car keys is a common problem and can happen at any time. You could have left the keys in the office, forgot them on the café table, or you have no idea where you kept them. The keys could also be stolen. In event your car keys are missing and you have no spare keys anywhere near you, we have the best solution for you. Whether you are in the office, home or on road in the middle of nowhere, no matter the time of the day, our dedicated locksmiths will find you and make a new key for your car. We cut and program a model-specific key as you watch. This only takes a maximum of 20 minutes to have you back on the wheels. 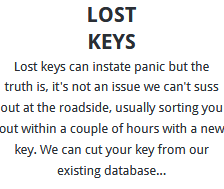 Even when you have a spare key for your car, it is important to call us and our transponder keys specialists will deactivate the lost key for maximum safety of your car. 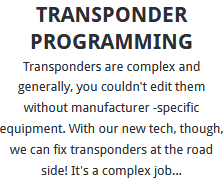 Contact us for any spare key cutting, transponder chip programming and extraction as well as key replacement or ignition or lock Broken Keys, lost keys and you will be assisted accordingly. With just a call, you will be joined by a team of competent locksmiths with the ideal solution. There are hundreds of self-declared locksmith companies in the Milton Keynes area, but only selected few have the right skills and experience to help you in case of any vehicle locksmith emergency. The process of finding the best locksmith in time of need may be hectic and you may even have no time to compare different providers. To avoid scammers, wastage of time and resources, turn to a well-known, tested and trusted locksmith company – Car Locksmith Milton Keynes. We have many years of experience in automotive locksmith industry and we have all the relevant advanced tools for any locksmith task. We serve all of the following regions of the Milton Keynes area: Newport Pagnell, Bletchley, Toddington, Woburn and Wolverton. Wherever you are in these regions, our technicians will be able to find you within a short span of time and they will sort you out in a flash. To ensure faster response to any location in the region, we have equipped our technicians with new service vans with GPS that enable them to get to you in a timely manner. Our drivers have the whole the Milton Keynes area map in their fingertips and they navigate the area with ease to get right to you without any delays. We have technicians already near you and it is a matter of minutes and you will have someone by your side ready to help you out of any locksmith disappointments. Lost and stolen vehicle keys. Brand and model specific spare key cutting. 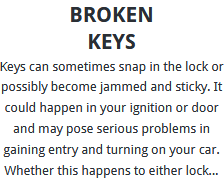 Removal and fixing of Broken Keys. Car trunk opening and retrieval of locked in car keys. Our number one goal is to provide reliable and top rated locksmith solutions to all motorists in the Milton Keynes area, and we have achieved this through our ever focussed and dedicated car keys expert locksmiths. Over the years this has been the case and we have a great record regarding our response time, quality of service, and the fairest costs in the area. Despite our high quality, our prices are still lower compared to our competitors and local car dealers. We emphasize on giving each client the value for their money. Depending on your budget, we have a package that fits your budget but guaranteed to work perfectly for your situation. We never overcharge you even when we are the only one offering a specific locksmith service within your vicinity. All Rights Reserved © 2018 Auto Locksmith Milton Keynes.